When I realized that I had to take Communication Law in order to graduate, I couldn’t help but sigh heavily. As if transferring wasn’t hard enough already, the credits of the law class I’d already taken at my previous school wouldn’t transfer over. After some sulking and complaining, I got my act together and signed up for the class. Two weeks later, I walked into Communication Law with a grim look on my face, absolutely convinced that this would definitely be the most boring class of my semester. It turned out, however, that Professor Shauna Froelich’s way of teaching about the First Amendment and court cases related to it would change my perspective on the class rather quickly. Every communication student who has taken Communication Law with Professor Froelich knows that she likes to keep things interesting by constantly starting debates and throwing in some very funny stories that she somehow always manages to relate to the topic. Unlike the other members of our Communication faculty, Professor Froelich is a lawyer. However, several years of practicing the law led her to disenchantment with it, she says. It was a networking opportunity that got her into teaching. “I started teaching and fell in love with lecturing,” she says. Professors Froelich (left) and Clampitt (right), pictured here with talk show host and political commentator Chris Matthews. Image courtesy of UW-Green Bay. She joined UW-Green Bay’s Communication department after lecturing as a part-time law professor at different universities for seven years. When she heard that our department was looking for someone to teach communication law, she was immediately intrigued. “That is the most fascinating area of the law, to teach the First Amendment. I love the debate, the controversy, the free speech, all the nuances, the really extreme, eccentric cases that come out of it,” she explains. 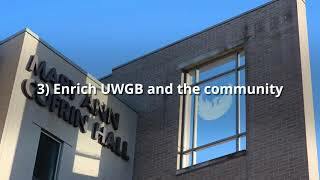 But Communication Law is not the only class Froelich is teaching these days at UWGB. Small Group Communication and Principles of Public Address are already on her schedule, and Theories of the Interview will be added starting in the fall semester of 2017. At the moment, it is the Public Address class that she likes to teach most. “There is something really raw about life and emotion that that class taps into where other classes don’t,” she explains. Just a couple of weeks ago, a former student from her public address class contacted her because one of his family members had passed away. He wanted her feedback and insight on the eulogy he had written for the funeral. “He actually came in to the class that he wasn’t even in and gave the eulogy just to practice for the funeral,” Professor Froelich says. Not every teacher is able to get students to open up in the ways that this class requires. But Professor Froelich has always valued her relationship with the people she is lecturing. Now that she is in her second year teaching full-time at UWGB, she has had the opportunity to watch them grow, because she’s had them in multiple of her classes over time. You might have guessed it: Professor Froelich wishes her day had a few more hours in it. That mom with the four kids and a husband, working full time, while also taking care of the dog? That’s her. A normal day in the life looks a little like this: she comes home from work, cooks for the kids, walks the dog, and then picks up the older two from track practices. During the kids’ youth group activities at church, there might be time for her and her husband to meet up with a friend, before finally falling asleep on the couch ten minutes into a Netflix show. “If I had more time, I would probably work out more, take better care of my health. I would pick up different hobbies, and spend more time painting, for instance. I would get more involved in the community on different boards…and probably just spend more time with my friends,” she says. Even though her days are long, Froelich enjoys working here at UWGB. Over the years, she has learned a lot, especially from Professor Clampitt, or as she sometimes calls him, ‘The Jedi’ or ‘Captain of the Ship.’ “He is a mentor and he is a brilliant professor who is very dynamic in the classroom,” she says. Her students grow, and so does she. Next Post - Next post: Students LOVE New Emphasis… YOU?